Druid Female #42F, the alpha female of the Druid Peak Pack has been discovered dead. Yellowstone Park wolf biologist Dan Stahler located #42’s bloody body from the air on the south side of Specimen Ridge on Wednesday 2/2/04 after seasonal park ranger and wolf researcher Rick McIntyre started receiving faint mortality signals from her collar on the previous Sunday. On Saturday, she and alpha male #21M along with the remainder of the Druid pack had been located in Little America feeding on a 8 month old bison calf. The two alphas, 42F and 21M had also been observed mating at that same time. Biologist Stahler stated that from the air #42’s carcass looked a lot like 217’s (see article below) with lots of blood. Typical of a wolf kill rather than an elk killed wolf. The end of January marks the height of the wolf mating season, and with the increase of wolves occupying the Little America area this year a confrontation was inevitable. One pack in particular, the Mollie’s Pack, originally named the Crystal Creek Pack and released first in 1995-96, originated in Little America but was driven off by the Druid Pack in late 1996 had, up until recently spent their time feeding on bison in Pelican Valley. Seven members of the Mollie’s Pack were located not far from #42’s carcass and are suspected of killing #42. The death of #42 will no doubt disrupt the surviving Druid Pack, and possibly be the final termination of this once most visible pack. No. 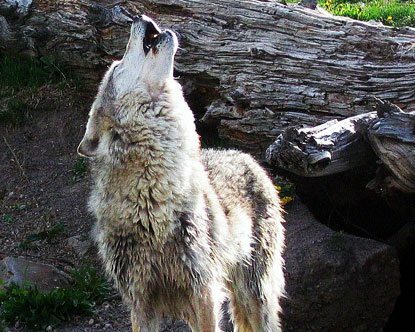 42F became known as the Cinderella wolf because of the years she suffered under her sister #40F, and dubbed “the Cinderella” during filming of the National Geographic film by Bob Landis, until finally 42F and one or more other wolves killed her in May 2000. No. 42 was fairly easy to identify from a distance with her distinctive “raccoon eyes”, which became even more noticeable on film. No. 41F, a sister to the now deceased #42F and #40F is the only known surviving wolf reintroduced into Yellowstone from Canada. No. 41 is struggling with age but continues to travel with the Sunlight Basin Pack east of the park. I have been predicting for the past year that something major would happen with regards to the Druid Pack. The alpha’s were getting old and the pups born in previous years were getting old enough to disperse and start new packs of their own.